The Whirl Wind STOL 200G propeller is ground-adjustable pitch propeller. Unlike conventional ground adjustable propellers, the Whirl Wind blade pitch system is easily adjustable in ½° increments from 9° to 26° via a single adjustment screw. This simple adjustment allows the pilot to make fast propeller pitch changes to optimize aircraft performance or endurance depending on specific needs. The 77” 200G is a two-blade propeller system designed for aircraft using the Lycoming IO-320**, -360, -375 & -390 engines (150 - 265 hp). This propeller incorporates the same wide cord blade and 215 series billet hub as our STOL Constant Speed Series. 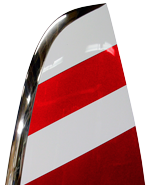 All Whirl Wind propeller systems consist of carbon fiber blades with nickel leading edge erosion shields, aluminum hub and a composite spinner. These hearty propellers have been designed to be flown in rain and snow, off unimproved airstrips and water. Whirl Wind has made significant developments in the construction of the carbon composite propeller blades ensuring a strong, light and durable propeller system with unlimited life. ** The 200G is available in a swept tip blade and is strongly recommended for low horsepower applications. 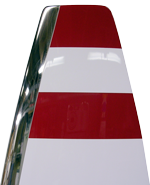 Standard Finish: White with Red tips or Black with White tips. Note: The 200G is available in a swept tip blade and is strongly recommended for low horsepower applications.